Episode 047 - We Review The Nice Guys N’Stuff! It has been a very busy week in the world of film, and the Epic Film Guys are here to run down all the week's news and talk about everything and anything. In this week's Epic Previews segment, we're taking a look at that new Ghostbusters international trailer and defending the film once again from people who seem bound and determined to hate it. Other reviewers have flat-out boycotted the film and refuse to review it, and we'll also weigh in on that controversy. We're also reviewing that latest awesome Star Trek: Beyond trailer, and taking a look at the teaser for Disney's live-action adaptation of Beauty and the Beast, starring Emma Watson. Last week we mentioned some contests and giveaways, and this week we'll elaborate on those a bit more. We're steadily barreling toward our 1-year podiversary, and we've got some big plans for that episode. With that said, we're going to start looking for YOUR opinions on the show, what you'd like us to change, what you'd like us to keep, and anything else you might like to see from the Epic Film Guys. We do this show because we love movies and we love our fans, so if there's something you'd love to hear, please let us know! We've been busy spreading our wings of late, and now that my wedding and honeymoon are over, we're getting out there and teaming up with other podcasts as often as possible. Listen for us on the season finale of Pat and Jason Have a Podcast, listen for me in a short segment on this week's Classy Little Podcast, and you can hear me in the cold open for episode 18 of the World of Ro Podcast. You'll also be able to hear me guest-hosting over on Poop Culture, where I'll join Rick Mancrush for his interview with Greg Lamberson, director of the B-movie classic Slime City and his latest horror comedy Killer Rack. We'll also be featured on Podbean (our host) for the week of May 30th! Thank you so much to everyone for sponsoring and supporting us. Last but most certainly not least, Justin and myself both got the chance to see the latest from director Shane Black: The Nice Guys! Starring Russell Crowe and Ryan Gosling, the film most certainly left an impression on us, and we want to let you know how we felt about it. Our review is a bit spoiler-y, so if you want to avoid it until you've seen the film, the review begins at 12:00 and ends at 30:30. And, in a quick segment for Justin's Cinema Beat, he'll give his thoughts on the comedy sequel Neighbors 2: Sorority Rising. We are everywhere! The main place to find us, of course, is www.epicfilmguys.com. The best thing you can do for us is hop over to iTunes and rate us and leave a review. With every review, we climb higher and higher in the rankings! https://itunes.apple.com/us/podcast/epic-film-guys-podcast/id1027239734. Listen to us weekly on Podbean, Stitcher, Spreaker, Blubrry, Overcast, Google Play Music, Player FM, and most any other podcatcher you choose. 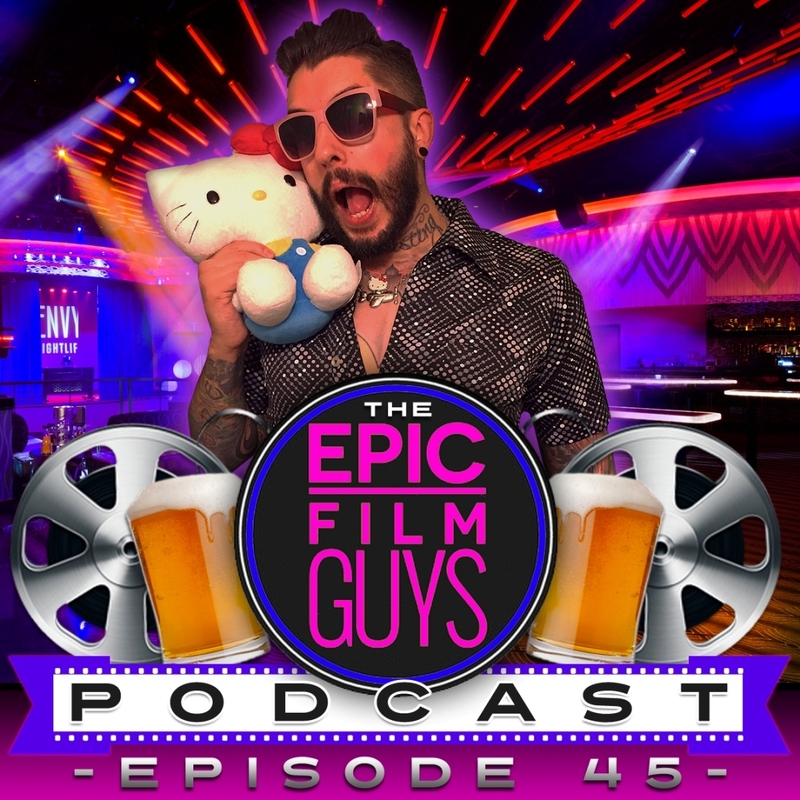 Our show is hosted at http://epicfilmguys.podbean.com, and our feed URL for subscriptions is http://epicfilmguys.podbean.com/feed/. Every other Wednesday, movie fanatics Pat & Jason rank & review your favorite movies! Their first season is coming to a close soon, featuring your very own Epic Film Guys! Subscribe at https://itunes.apple.com/us/podcast/pat-jason-have-podcast-movie/id1068616890. A huge shout-out and thank you to Emily and James and the Classy Little Podcast for their support, and I wanted to take a moment to recognize Emily's work with #PodernFamily, for keeping tabs on everything and most of all, keeping me informed. You can check them out and rate them at https://itunes.apple.com/us/podcast/classy-little-podcast/id1019422584. Our heartfelt thanks go out to our supporters! Thanks to you, we can start moving forward with our goals and looking at new equipment and opportunities. We do this show for you, and your support is what will make us continue to grow. You can help the show by going to www.epicfilmguys.com/support or following the link there to: http://cf.podbean.com/crowdfund/profile/id/hfp2d-2f4/Epic-Film-Guys-Podcast. A pledge of any amount will earn you a shout-out in our special new "supporters" segment! Visit our website at http://www.epicfilmguys.com! It is rather rudimentary at the moment, but you can find all of our social media and blog posts there, as well as some written reviews and other content. It is the main hub for your EFG experience! Outro "Far Beyond the Sun" by Yngwie Malmsteen. All Rights reserved. Selected tracks from Cobra: The Original Motion Picture Soundtrack. All Rights reserved. "Jumpin' Jack's Flash" by Michael Giacchino. All Rights reserved. Episode 046 - Spider-Iron 4: Panther War! We are BACK, ladies and gentlemen! We did drop the bloopers episode last week while I was sunning myself down in beautiful Punta Cana, but this will be my first official episode recording as a married man. It was a great wedding and reception and a really relaxing honeymoon, and we take a few moments to discuss some of the finer points of the last week and a half right at the top of the show this week before we jump into the meat of this week's episode. Civil War is upon us! With Batman v Superman: Dawn of Justice now behind us and extremely divisive, we turn our attention to the much-better-received Captain America: Civil War. We are especially outspoken critics of the Marvel formula, especially myself- did this film break the Marvel mold? Can a Marvel film impress me enough to get a rating above a "pretty decent" 7/10? You'll have to listen to find out! We'll also look back to two weeks ago and our Civil War wish lists, and see if we got what we wished for before we had a chance to see the film. This week, we're also looking to the future of Epic Film Guys, particularly to new content and a new contest! Would you like to win a $25 AMC theaters gift card? All you need to do is listen to the Epic Film Guys podcast! More details to come, but your first chance to will will be our Thursday, June 2nd episode. Stay tuned! Finally this week in Epic Previews, we'll be dissecting some new trailers (or at least new to us, since I've been away). We're taking a look at the first official trailer for the video game adaptation Assassin's Creed, starring Michael Fassbender and Marion Cotillard. We'll also be reviewing The Accountant, starring Ben Affleck, J.K. Simmons, Anna Kendrick, John Lithgow, and Jeffrey Tambor, and looking at the creepy teaser for The Woods, the new horror thriller from director Adam Wingard being hailed as one of the scariest movies ever made. The Bloodlust is your go-to podcast for classy broads & a token dude talking horror. Check them out at https://itunes.apple.com/us/podcast/the-bloodlust/id926069467. Intro & Outro "Far Beyond the Sun" by Yngwie Malmsteen. All Rights reserved. "Clash" by Henry Jackman from the Captain America: Civil War Soundtrack. All Rights reserved. Episode 045 - Bloopers & Outtakes & Lisps, oh my! Long-promised and much-anticipated, the blooper show has arrived! I didn't want to miss an episode release just because I'm sunning myself in beautiful Punta Cana this week on my honeymoon, so I decided to throw together a massive clip show featuring all of the bloopers, outtakes, and cut segments that I've got lying around from months and months of recording the podcast. It allows a bit of a peek into the behind-the-scenes production of the podcast and how we do our lead-outs and lead-ins, how we synch our recording tracks, and how we flub lines- intentionally or otherwise- and it breaks everything down. First up in the episode is a heated debate between Justin & James of the Classy Little Podcast, after James dismissed Justin's notion that Sylvester Stallone was one of the "great creative minds" in the film industry. This couldn't make the cut in the Oscars episode since that was already running way too long, but I thought I'd save it and play it here, since we definitely get passionate from time to time about our favorite films and our favorite film stars. As the episode rolls on, we'll hear some lead-in bloopers and outtakes, as we can never quite seem to nail the lead-in to the episode or different segments on the first take. Sometimes I even try to get a little bit fancy or do something unique, and it almost always fails. Enjoy clips in this section that also feature our good friend (and guest on the show) Dan Brenic as well as our brothers in Perth, Paul & Wayne from The Countdown. We'll also have an audio tribute with a whole slew of Lisp outtakes. Lastly, I decided to include another video from the EFG video days, this being our visit to the Zombie Walk in Binghamton in 2014. You can check out this great video over at https://www.youtube.com/watch?v=FCy_vJ1O_ow. It's a shame that the guy we had partnered up with turned out to be a complete flake, because this was a lot of fun, and I really feel like Epic Film Guys could've gone in a completely different direction. But then, would we even be the Epic Film Guys podcast if that were the case? We'll never know. The Earth Collective is a serial drama about "the last remaining group of humans stranded on Oasus, fighting to run from The Dark." Season two is on hiatus, so please listen to season one and let them know you're a supporter. Listen to season one and subscribe to them at https://itunes.apple.com/us/podcast/the-earth-collective/id1039645558. Follow TEC on twitter @TECStory. The Classy Little Podcast is one of the most fun shows you could listen to, where they pick a topic and delve into its histories and controversies. James and Emily are hilarious and fun, and you'll be hooked after one episode. Check them out and rate them at https://itunes.apple.com/us/podcast/classy-little-podcast/id1019422584. Follow them on twitter @classy_podcast. The Afterburn739 podcast comes to you live from the Scrish bar, as Kitty, Leo, Midge, Cobra, Jackie & Fez explore the latest in pop culture. One listen and you'll be a regular! Check them out at https://itunes.apple.com/us/podcast/afterburn-739/id1003616097. Follow them on twitter @afterburn739! Do you love inappropriate humor? Join the guys over at Paint it Black Podcast for drunken discussions of weird news! Find them at https://itunes.apple.com/us/podcast/paint-it-black-podcast/id591552828. Follow them on twitter @PIBComics. Intro music "Animation Piano" & "Last Dawn" courtesy of Ross Bugden. Find his royalty-free music library on youtube at https://www.youtube.com/c/rossbugden and follow him on Twitter and Instagram @RossBugden. "Epic Film Guys Theme" courtesy of Eric Askew. "Is She with You" from Batman v Superman: Dawn of Justice Official Soundtrack by Hans Zimmer & Junkie XL. All Rights reserved. With Marvel's Captain America: Civil War opening in theaters nationwide tonight, we decide to take some time to discuss our wish list for Civil War and count down our five biggest wishes. I'll be seeing the show tonight, and Justin will have likely already seen it by then. We won't be able to review the film in full for a couple weeks yet due to my wedding and honeymoon which are speeding toward me, so hopefully this will sate you, dear listeners, as you await our review show. Next week's show will be the much-discussed blooper episode, which packs its share of surprises and funny moments. This week, Justin's Cinema Beat returns, and he is joined by Bryan Loy from Ten Bucks a Throw to review two different films! First, they'll discuss Richard Linklater's latest film, Everybody Wants Some, before discussing the very Kubrick-inspired thriller High Rise. The episode this week wraps up with the guys discussing the villain Apocalypse from the upcoming X-Men: Apocalypse and the fanboy reaction that they were somehow responsible for changing his look. Yet, according to the cover of EW, he's always been the same color! We'll weigh in on this, as well as hearing director Bryan Singer's thoughts on the controversy as well. Join John Medina as he discusses the latest in tech, games, pop culture, and everything in between. Give him a listen, otherwise he's just some dude talking to himself on the internet. Subscribe at https://itunes.apple.com/us/podcast/the-just-john-podcast/id1037549339 & find him on twitter @johnnym_revo. On the Poop Culture Podcast, you'll hear Derek & Randy Boobie along w/pop culture powerhouse Rick Mancrush. They're bringing you their take on all kinds of stuff! Subscribe to them on iTunes at https://itunes.apple.com/us/podcast/poop-culture/id1062454240. Follow them on twitter @poopculture. You can find Bryan Loy on twitter @BryanLovesFilm and his podcast @TenBucksAThrow. He is also a frequent collaborator with the Picture Lock show, so be sure to check out some of their videos over at https://www.youtube.com/user/PictureLockShow. "A New Bunny" by TLG Media. Find the uncensored video at https://www.youtube.com/watch?v=Ivzp9wmrcwE.